In a late twist just days before American opens its season at Maryland, the NCAA granted the Eagles a waiver allowing GW transfer Matt Cimino to play right away instead of having to sit out a year. Usually transfers have to ride the pine a year, but Cimino — who left GW around the end of spring classes and made the transfer official in May — was granted a waiver. This is likely due in part to circumstances surrounding the Colonials basketball program. In early summer, The Washington Post first reported allegations of verbal abuse from coach Mike Lonergan. He was then fired this fall. Regardless, this is a big deal for the Eagles, who now have three 6-foot-10 players in their rotation for the first time in a long time (fact checkers, help us out here). It didn't take long for Cimino, 6-10 and 212 pounds, to make his decision. It didn't hurt that he had met and taken a liking to coach Mike Brennan when Brennan was an assistant at Georgetown. “I think definitely just the feel I got with the coaching staff and players. That was definitely key right away. I could feel that just being on campus," Cimino said. 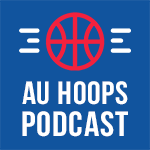 Cimino will join freshman Mark Gasperini (6-10, 250) as AU's two primary players at the 5 — arguably the most important position in the Princeton offense — with the 6-10, 220-pound Andrija Matic, who played a lot of 5 as a freshman, shifting most likely to the 4. Brennan said he eventually hopes to have both Cimino and Gasperini on the floor together. Not that it's necessarily that important now, but Cimino, of Falmouth, ME, was ranked No. 138 in the country coming out of high school in 2014. Now, he gets the chance to prove himself in the Patriot League going against the likes of two-time conference player of the year Tim Kempton of Lehigh. What does the lanky forward/center need to work on the most? Cimino didn't hesitate: his strength. We'll see how Cimino's body holds up throughout the season. For now, the transfer is happy for the chance to play right away and in a system that he enjoys with plenty of coaching. “I like playing the offense," Cimino said. "Since I’ve been here, I’ve really enjoyed it. Coach Brennan’s a really good teacher of it. At the center spot and even at the four spot, you’re able to do a lot of things, you’re able to make a lot of decisions. As a big man, it’s not so much you want the ball to score. You just want the ball to be in the offense.